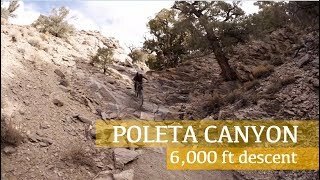 After climbing up out of Black Canyon, you are treated with a long descent that starts out fun, and quickly turns into some of the best riding around as you fly down a wash. Further down, the trail is not quite as fantastic, but still offers good fun all the way to the Owens Valley. Heading north, the doubletrack soon fades away into a trail. It sidecuts along the ridge for a while, before dropping into a wash for the best part of the trail which features fast, slightly banked turns and small, dry waterfalls for some technical challenge. Too soon, you come out into a meadow, where you could make a right for Poleta Ridge. Instead, continue down for a bit more fun canyon riding. Just after, you'll make a short climb out of the wash and descend a loose trail. It carves around to a short push out of another wash and around to a traverse of some talus that can be challenging. You'll come out at a mine and descend some doubletrack down a ridge. This takes you into the Poleta OHV area. If you can follow the track or find a good route on your own, you can go most of the way through it on fun, but loose, singletrack.